Re: The record's stuck . . .
Vrede wrote: Seems to have quit now, the pages do stop loading. Nope, no ads at all... period. Could be more temporary issues with the host. Glad it quit though. Now if you experienced a glitch for a about 10 minutes between 4:36 and 4:46.... that was totally my fault. Vrede wrote: ...I'm able to read and post just fine but the page won't quit trying to load. Happening again. Not that it matters, I can just stop the page loading without causing problems. Just thought you'd like to know. Always glad to know. Hasn't happened for me yet though, anyone else having similar problems? Vrede wrote: I haven't since Thursday. Oh shoot, that message was older than I thought it was, my bad! Too much going on! Vrede wrote: Still fine, maybe some of the chipmunks took the weekend off. 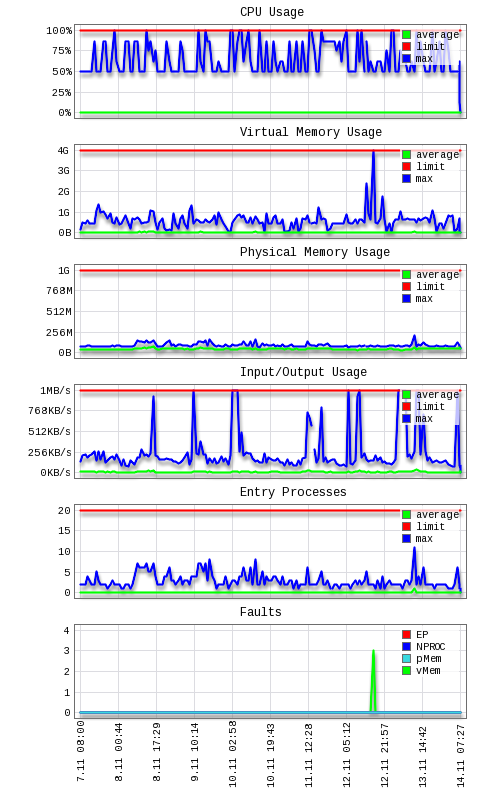 Looks like someone has been using a disproportionate amount of CPU time on the host, or they had a runaway process. You can tell where they killed the process because it stays at a consistent 50% to 100% utilization for a few days and then drops to 0. That's a 7 day history...!